Detectives investigating devices sent to addresses in London and Glasgow have said a claim of responsibility has been made in the name of the "IRA". The Met and Police Scotland said similar packages were sent in the past by dissident Northern Ireland groups. Officers also revealed that one package may be unaccounted for. The devices arrived on 5 and 6 March at Waterloo Station, buildings near Heathrow Airport and London City Airport and the University of Glasgow. A joint statement from Police Scotland and the Metropolitan Police said the claim of "IRA" responsibility was received on Monday by the Belfast-based Irish News. A recognised codeword was used. It added: "Given the packages received last week bore similarities to devices sent in the past which were linked to dissident groups associated with Northern Ireland-related terrorism, officers were already looking at this as a line of inquiry. However, we continue to keep an open mind and enquiries continue. "We continue to urge the public to remain vigilant and report anything suspicious to police." 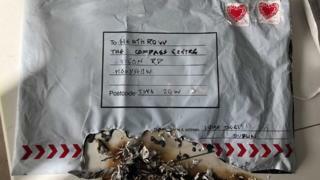 The parcel bomb incidents come almost a year after MI5 downgraded the threat posed in Britain by Irish Republicans. On 5 March, three "small improvised explosive devices" were found at sites across London. Scotland Yard said the packages were all A4-sized white postal bags containing yellow Jiffy bags. One caught fire when opened by staff at Heathrow. Irish police have been assisting the Met as the Heathrow and Waterloo packages had Republic of Ireland stamps. The following day, a suspect package was found in the mail room at Glasgow University. Several university buildings were evacuated before bomb disposal officers detonated the item.